Brick manufacturing is the fastest-growing industrial sector in Bangladesh and among the top three sectors, along with vehicle exhaust and resuspended road dust, contributing to the air pollution and health problems in Dhaka. The brick manufacturing in the Greater Dhaka region, from ~1,000 brick kilns spread across six districts, is confined to the winter season (October to March) as current technologies do not allow production during the monsoon. The total emissions are estimated at 23,300 t of PM2.5, 15,500 t of sulfur dioxide (SO2), 302,000 t of carbon monoxide (CO), 6,000 t of black carbon, and 1.8 million tons of CO2 emissions from these clusters, to produce 3.5 billion bricks per year, using energy-inefficient fixed chimney bull trench kiln technology and predominantly using coal and agricultural waste as fuel. The associated health impacts largely fall on the densely populated districts of Dhaka Metropolitan Area (DMA), Gazipur, and Narayanganj. Using the Atmospheric Transport Modeling System dispersion model, the impact of brick kiln emissions was estimated over DMA—ranging from 7 to 99 μg/m3 (5th and 95th percentile concentration per model grid) at an average of 38 μg/m3; and spatial contributions from the surrounding clusters—with 27 % originating from Narayanganj (to the south with the highest kiln density), 30 % from Gazipur (to the north with equally large cluster spread along the river and canals), and 23 % from Savar. The modeling results are validated using evidence from receptor modeling studies conducted in DMA. 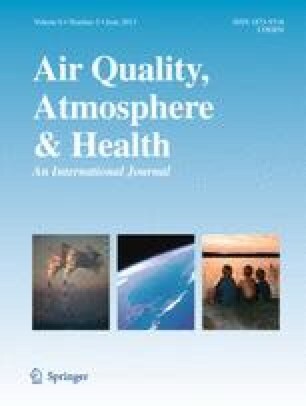 An introduction of emerging vertical shaft combustion technology can provide faster benefits for public health in DMA and reduce climate precursor emissions by selecting the most influential clusters discussed in this paper.